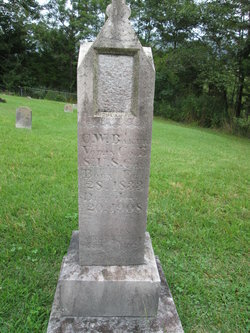 Although the address for the cemetery is traditionally given as “Kyles Ford”, the official location is Eidson, in Hancock County, Tennessee. It resides on a hill near the Clinch River on Route 33-Kyles Ford Road, between Willis Chapel Road and Fleenor Circle. The Baker Cemetery takes its name from the man who donated his land for its use, Alfred Baker (pictured left). 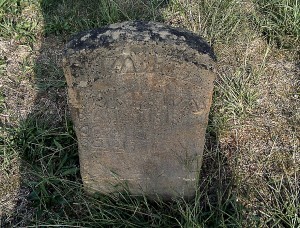 Alfred donated the land for the old section of the cemetery. It already contained graves going back to the late 1700s, including Bakers, Wallens, Livesays, Roberts, Holts, Johnsons, Moores, Singletons, Snodgrass and other families. 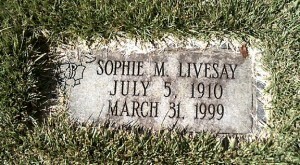 Alfred’s daughter, Sophie (Baker) Livesay, later donated more land for the cemetery. Her family also oversaw its care and upkeep for many years. 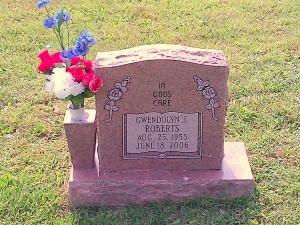 My dear sister, Gwen Roberts, 1955-2006. She was my mentor and best friend. My father, Foyster W. Roberts, 1928-2010. I’ve never known a better Christian or father. 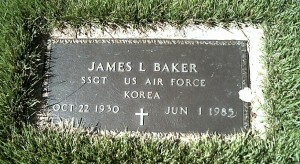 My uncle, James Baker, 1930-1985. He taught singing schools and helped organize county and state singing conventions throughout the South. My uncle, Claude Roberts, 1931-1987. He and my dad were close when they were young and Claude served as dad’s best man at his wedding. 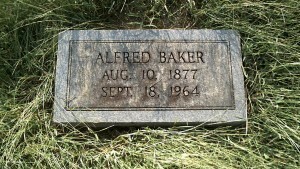 My great grandpa, Alfred Baker, 1877-1964. He donated the land for the original cemetery, hence its name. 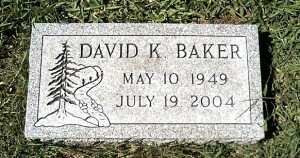 Ironically, his grave is located smack-dab in the middle of the cemetery, right on the border of the old and new sections. 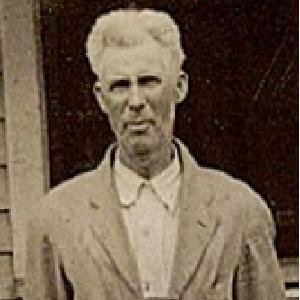 My great, great, great grandpa, Andrew C. “Big Andy” Baker, 1814-1861. 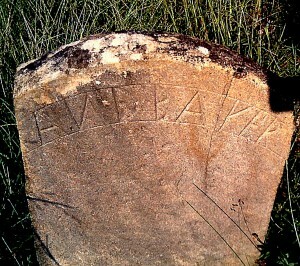 His tombstone appears to be homemade and is very weathered. 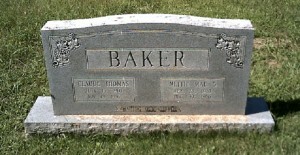 My great, great, great grandma, Elizabeth “Betty” (Roberts) Baker, 1818-1913. My uncle, Tom Roberts, 1918-1978. Due to a birth injury, he had the mind of a child. 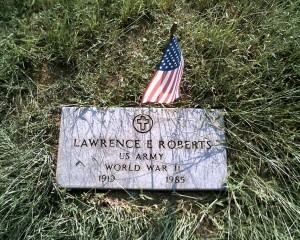 He lived with my uncle Lawrence’s family till his death in 1978. He loved to play records. When we would visit Lawrence’s family, Tom would insist that my brother Greggy be carried back to his room and he would play Southern Gospel music for him. He knew that Greggy loved it. 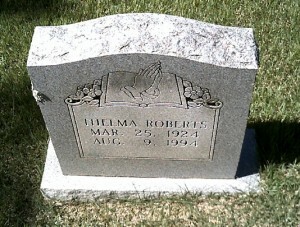 My grandmother, Esta Mae (Wallen) Roberts, 1896-1955. 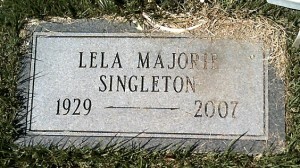 She asked to be buried here next to her father since the space next to her husband in the Austin J. Bledsoe cemetery had already been taken by his oldest sister and her husband. 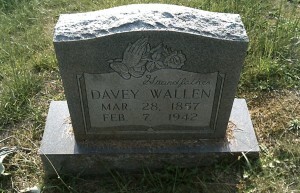 My great grandpa, Davey Wallen, 1857-1942. 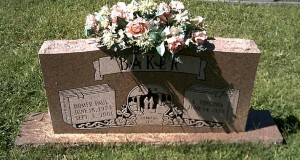 He and great grandma are buried on opposite sides of the cemetery. 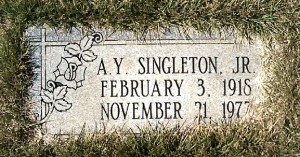 This was due to him requesting, “Whatever you do, don’t bury me in water.” When they dug the grave next to hers, it filled in with water the next day. 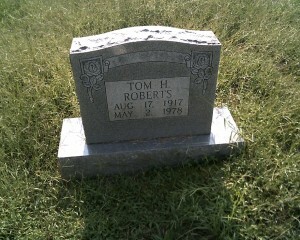 So, they put great grandpa on the opposite side of the cemetery. 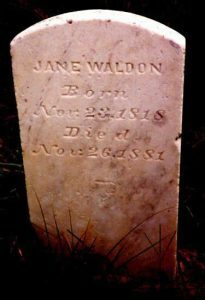 My great, great grandma, Jane (Banks) Wallen, 1818-1881. 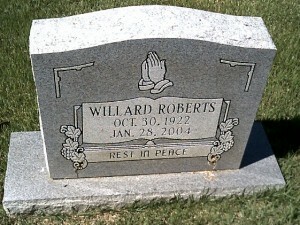 William J. “Big Sandy” Wallen, 1816-1886. 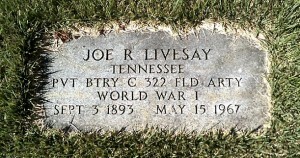 He has a veteran’s headstone, due to serving in “Company L, 8th Regiment of the United States Army of Tennessee”. 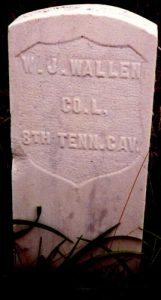 His son Joe B. Wallen, who is buried here also, was conscripted by the Confederate Army, captured at Vicksburg, paroled, then joined the Union Army with Big Sandy. Jeff, Now I know this is you that created this site, correct? This is AwEsOmE, and such a GREAT TRIBUTE! Hello, I was researching my 5th great grand father Elisha Wallen when I found this site. It would appear that we are somewhat related. I am also decended from “Big Andy”. He was my 3rd great grandfather as well. I am then decended from Joseph Robert Baker. I have not been in Kyles Ford since Grandad’s funeral in 1998 and do not recall ever having been to this cemetary. 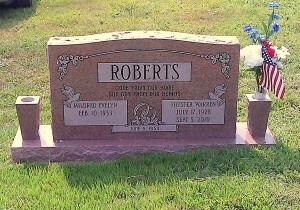 The Livesays and Testermans are buried in the cemetary off of Old Kyles Ford Rd. I would like to ask permission to copy some of these photos into my family tree (only on my computer, not anywhere online, nor published in any form). I would, of course, give you credit for the photos if you provide me with the information you would like attributed to the photos. Thank you, I look forward to hearing from you. 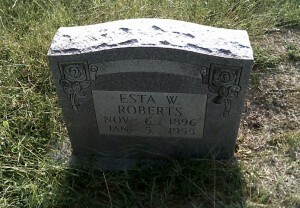 I was just at this cemetery on Easter, looking for the grave of my grandmother, Bessie Roberts, even though I am sure sure is buried in the Roberts cemetery (which I couldn’t find!). I wasn’t sure who many of the people were, but I am so grateful for your descriptions, especially of some of the more worn graves. 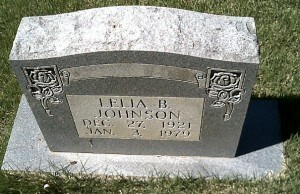 I am so excited to know that this is where my Great Great Great Grandfather,Big Sandy, is buried! I will have to come back on another occasion and pay my proper respects. Thanks so much for sharing!